Caricatures are great for entertainment, gifts, business promotion, and just generally getting your event or company to stand out! Click the image below for samples and information on Contract Caricatures for gifts, marketing, logo mascots, programs and more! Click HERE for Contract Caricature Rates! Click the image below to view more information about Party Caricatures for events, including rates, methods and online booking! 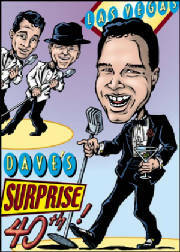 Click HERE for Jay's Party Caricature Rates! "(The Caricatures) turned out great!!! Thanks again!"